About four years ago, not long after her family moved to Anchorage from Connecticut, where she had enjoyed watching one of her brothers compete in ski jumping, Rowan Folds decided to take the leap. She imagined the speed gliding down the jump, the wind in her face and — oh, yeah — the feeling of flying. She was gripped with anticipation and exhilaration. "It looked super-fun," said Folds, 15. "And I really enjoy heights. I really enjoy doing something a little scary. "You will be nervous. But that first jump just makes you want to do it again. It's so much fun. One second you're on top of the jump and then you're in the air — wow! It's the closest sport to flying." 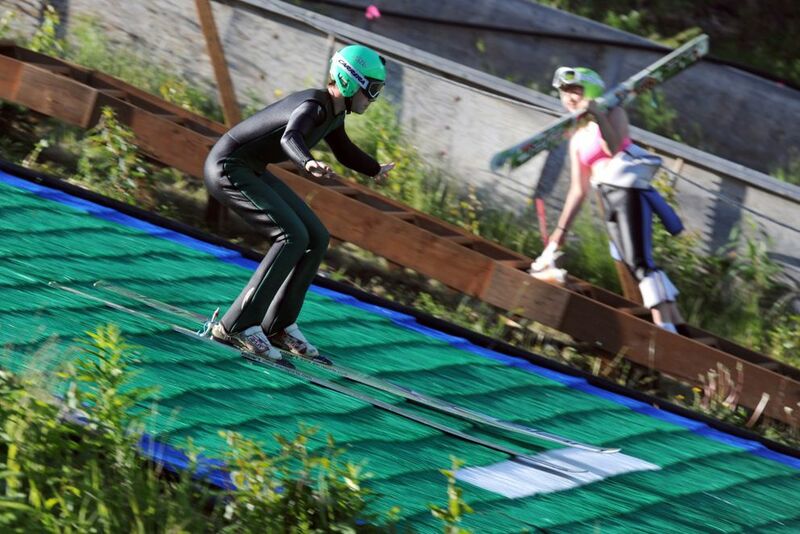 And now Folds and her peers can train year-round in Anchorage, courtesy of the Nordic Skiing Association of Anchorage's expansion into summer ski jumping at the Karl Eid Ski Jumps at Hilltop. With $300,000 from a $950,000 grant the NSAA received from the state, and another $100,000 to $200,000 in corporate donations, in-kind donations and volunteer labor, the state's only ski jumps have been fortified and transformed. "It's a great example of a community coming together to realize a dream," said Karen Compton, who co-chairs the NSAA's ski jumping/nordic combined division. 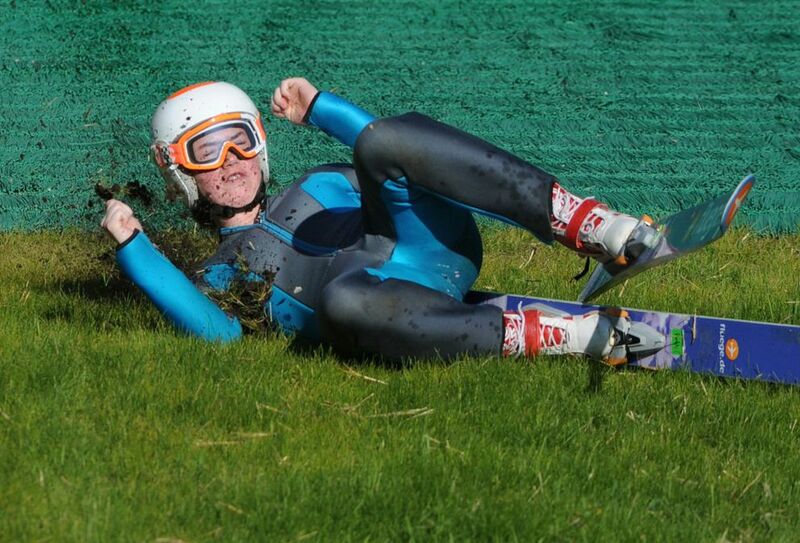 "We've resurrected not just the facility, but the (ski jumping/nordic combined) club. "Anchorage is a nordic city. this is what we do. We do nordic skiing. We do biathlon. We do ski jumping and nordic combined." The NSAA is in the third and final year of improving the Karl Eid Jumps, which include a 10-meter jump and 20-meter jump that utilize a common landing area, and a 40-meter jump and 65-meter jump with separate landing areas. The references in meters basically denotes the distance from the end of the jump to the point where the landing area begins to flatten — thus, a jumper launching off the 65-meter travels through the air farther than half a football field. Artificial turf-type landing areas, complete with watering systems that furnish a slick landing area akin to snow, have been installed on the 10-, 20- and 40-meter jumps. 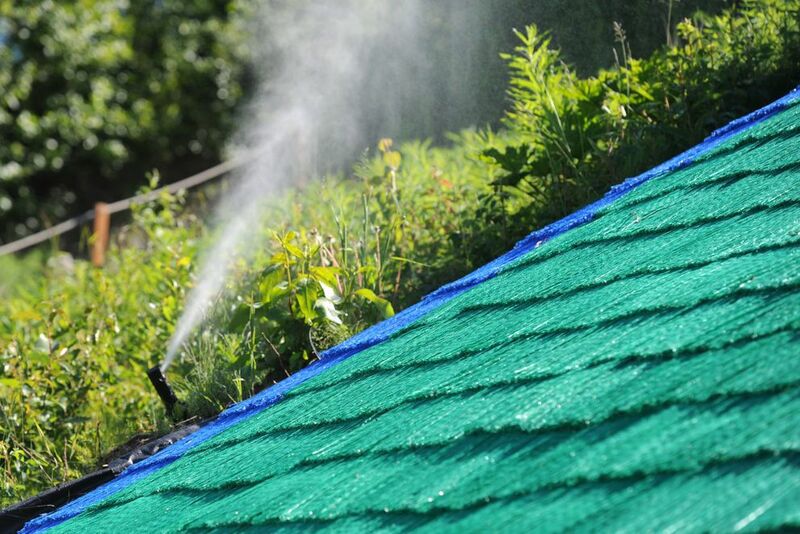 Beneath layers of the green plastic grid are, from bottom up, gravel and timbers, old rubber conveyor belts, a textile to keep weeds from emerging and a foam layer. The NSAA hopes to complete similar work on the 65-meter hill later this summer. Previously, Alaska jumpers had to travel Outside, to places like Utah and Colorado, for offseason training. "It gives us a lot of advantages," said ski jumper Gustavus Compton, 15. "All the successful clubs have summer jumping, and that's why they do so well. The fact that we didn't have summer training was a huge setback." 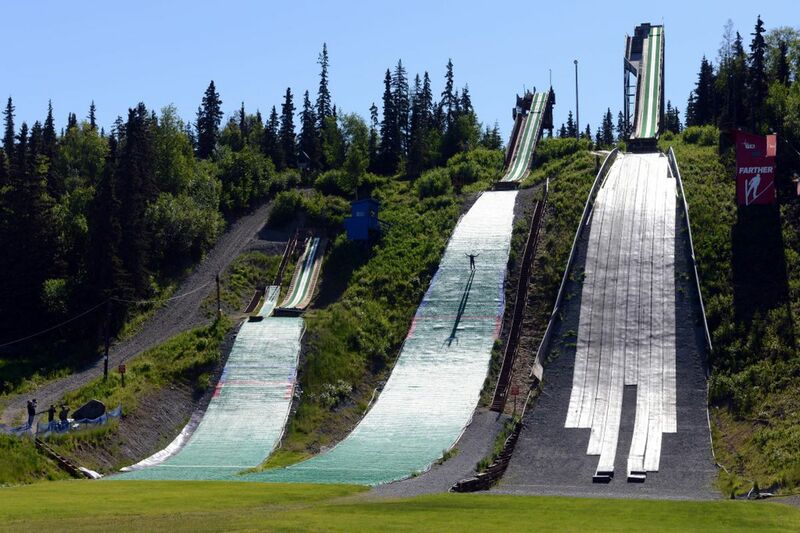 NSAA ski jump coach Zak Hammill said a year-round facility is necessary for Alaskans to compete nationally and internationally in the Olympic sports of ski jumping and nordic combined, a sport that features nordic skiing and ski jumping. "To stay competitive, you have to jump year-round," Hammill said. "It is literally everything. Before, we'd take a two-week trip (Outside) — two days of that were travel — and you'd get 50, maybe 75 jumps. "We'd leave and everyone else (in the Lower 48) was still training. Now, the playing field is level." On June 15, Hammill supervised four young jumpers in a training session. Folds, Nathan Shuttleworth, 16, and the Compton brothers — Gus and 16-year-old Hugo — each took a series of jumps of the 40-meter hill. After each jump, the athletes shed their skis and marched back up the two long staircases leading to the top of the jump, getting feedback from Hammill, who taped several of the jumps. The stair-hiking, especially in Anchorage's recent sun-splashed conditions, is a grind, yet it builds necessary leg strength. From the end of the jumps, Denali and Mount Foraker towered off to the north, Mount Iliamna loomed dead ahead, and Anchorage and Cook Inlet furnished more dramatic scenery. "This is my office," Hammill said. As jumpers hiked back up the stairs, Hammill offered technical advice and plenty of positive reinforcement. 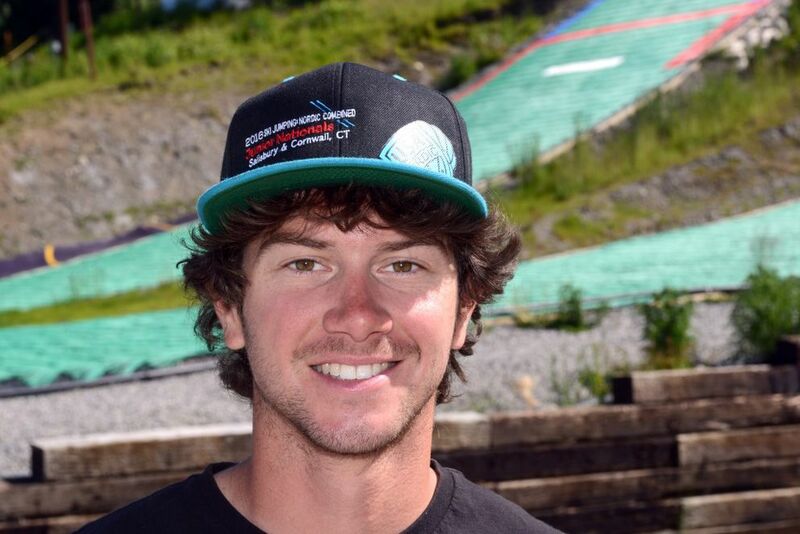 Compton's boys, Gus and Hugo, began ski jumping six years ago when they were alpine skiers. They saw a notice for ski jumping on the NSAA website and decided to give it a try. "By the end of the day, we decided we liked it," Hugo said. There were only three other local jumpers. A jumping coach soon quit because he was commuting from the Kenai Peninsula. In stepped Karen Compton and Vivian Murray. The mothers of ski jumpers took over a program that once produced three-time Olympian Alan Alborn of Anchorage but had withered. "It wasn't a coup," Karen Compton explained, "because there was no one to overthrow." Compton and Murray promoted the program, lobbied the Legislature and boosted participation. About 60 jumpers regularly trained in the NSAA program last winter, Compton said, and this summer's training — several days a week — has drawn about 25 jumpers. Hammill believes the program boasts vast potential. Last winter's lack of snow and its repeated thaws was crippling because the 40-meter jump was open for part of a single day and the 65-meter jump wasn't open at all. Still, Hugo Compton bagged two bronze medals at the Junior Olympics, one of them in the team nordic combined sprint with Shuttleworth. "And that's with my season consisting of eight jumps, all at nationals," Hugo said. Lack of snow is unlikely to be a problem next winter. In a critical upgrade, the ski jumping division has acquired a used snow gun and snow-making system. "We're kind of drinking from the fire hose," Karen Compton said. 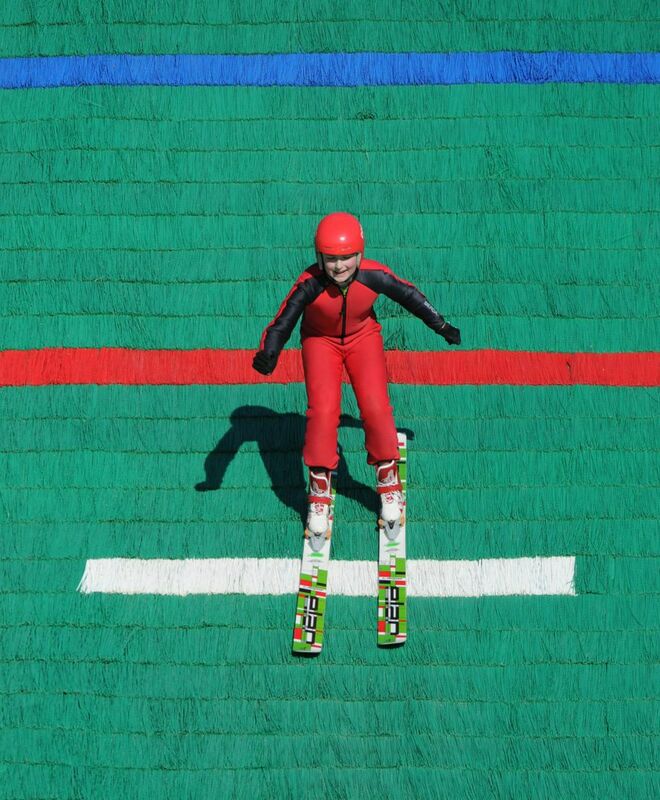 She believes the courage required to be a ski jumper builds confidence, which elevates character. And the sport is not dangerous, she said. Jumpers travel long distances in the air, but they are than 10 feet above the landing area. In roughly 20 combined jumps Wednesday morning, no athlete tumbled. "It's a safe place for risk-taking," Compton said. "It's a sport that's surprisingly safe, but takes courage." And that appeals to Folds. The 40-meter jump is the biggest she has conquered, but she intends to soar off the 65-meter jump by summer's end. "I can't wait to be on the bigger jump so I can be in the air longer," she said.